Human face traits are so diverse because of evolutionary pressure, according to a new study published in Nature Communications. 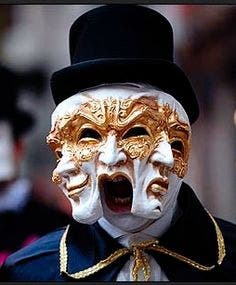 Photo: Lynolive, Venice Carnival. While you might find people sometimes resemble each other, if you look close enough you’ll soon find unique features and facial characteristics that sets them apart. It’s remarkable how diverse human faces are across the billions alive today and the countless billions that used to live in this world. Scientists at University of Berkeley now believe they understand why this is the case: humans have evolved facial variety to make each of us look unique and easily recognizable. “The idea that social interaction may have facilitated or led to selection for us to be individually recognizable implies that human social structure has driven the evolution of how we look,” said coauthor Michael Nachman, a population geneticist, professor of integrative biology and director of the UC Berkeley Museum of Vertebrate Zoology. The premise started from a fundamental question: is the widely recognized variance in facial features, like the distance between the eyes or width of the nose, dictated purely by chance or has there been evolutionary selection for these to become more variable than they would be otherwise. To answer this question, the team of researchers first mined a 1988 U.S. Army database that compiled male and female body measurements, then made a statistical comparison of facial traits: forehead-chin distance, ear height, nose width and distance between pupils. Comparisons in other parts were also made, like forearm length, height at waist, etc. The researchers found that facial traits are much more variable than other bodily traits, such as the length of the hand, and that facial traits are independent of other facial traits, unlike most body measures. People with longer arms, for example, typically have longer legs, while people with wider noses or widely spaced eyes don’t have longer noses. Both findings suggest that facial variation has been enhanced through evolution. This significant physical difference between facial trait variance and the degree of variation of all other body parts was then put to the test by accessing genetic logs. The researchers turned to the data collected by the 1000 Genome project, which has sequenced more than 1,000 human genomes since 2008 and catalogued nearly 40 million genetic variations among humans worldwide. Looking at regions of the human genome that have been identified as determining the shape of the face, they found a much higher number of variants than for traits, such as height, not involving the face. Of course, since it has proven to be so productive for humans to be social, cooperate and work together with their peers it seems natural for evolution to facilitate a species grow even further employing the same mechanisms. Other animals, however, which don’t rely that much on vision to distinguish individuals from the same species, seem to look more like each other. With this in mind, what about our hominid ancestors? Were individuals then also geared towards facial uniqueness? It’s yet to early to speak about ancestors who lived hundreds of thousands or even millions of years ago, but the more recent Neanderthals and Denisovans are a different matter. The researchers compared human genomes with those sequenced from Neanderthals and Denisovans and found similar genetic variation, which indicates that the facial variation in modern humans must have originated prior to the split between these different lineages. “Clearly, we recognize people by many traits – for example their height or their gait – but our findings argue that the face is the predominant way we recognize people,” Sheehan said. Findings appeared in the journal Nature Communications.